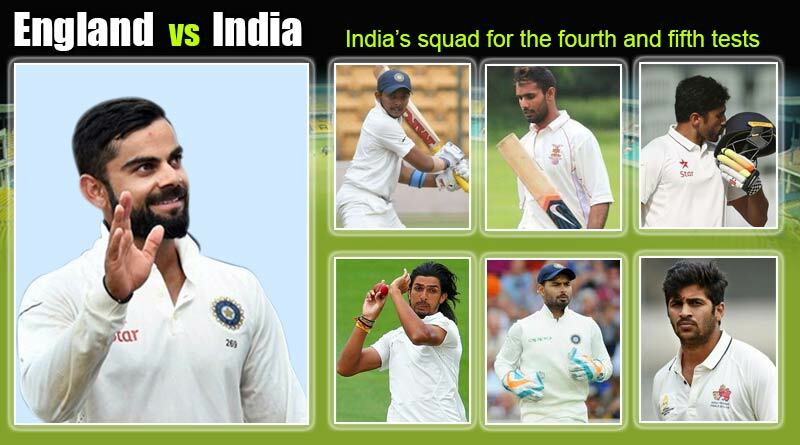 The BCCI on Wednesday announced India’s squad for the fourth and fifth tests of England Vs India Test Series. The matches which will be played on the 30th August and 7th August respectively saw Prithvi Shaw and Hanuma Vihari be drafted into the side as India look to equalise the series. Spinner Kuldeep Yadav and opener Murali Vijay found themselves out of favour after an abject showing in the first three tests. Soon after India had sealed one of their most famous win against England, the BCCI and Indian cricket team management got down to finalising the team for the remaining two tests of the five match England Vs India Test Series. And the verdict was two youngsters being rewarded for their impressive and consistent performances in the IPL and domestic circuit. Regularly catching the eye of the selectors with their over the top performances, which have boasted not only immense talent but equal application on the pitch, Shaw and Vihari finally saw their fortunes take a turn for the better with a place in the test squad. Being selected for two crucial tests in one of India’s toughest tours till date shows the enormity of Shaw’s and Vihari’s selection. The faith and belief put by the selectors in the duo is immense given the stakes at hand for India. With wicket-keeper batsman Rishabh Pant earning a maiden call-up to the test side in Nottingham, the BCCI has with these two picks made their policy of going forward with youth clear. Shaw comes in to replace a poor Murali Vijay. The opener who had failed to get going in the first two test matches finally lost faith with the team management for the third test. Dropped for Shikhar Dhawan who justified his selection with important contributions over the course of the match, things got worse for Vijay on Wednesday with the 18-year old Shaw taking his side in the team. Shaw, who captained India to the Under-19 World Cup title in February, has shown promising glimpses for India A and the Delhi Daredevils. Meanwhile, 24-year-old Vihari has been brought into the side as cover to spinner Ravindra Ashwin. With Kuldeep Yadav failing to perform the requisite job asked of him in the Lord’s match and Ashwin having fitness scares, Vihari has been given the nod ahead of chinaman Jadeja and Yadav. India’s squad for the fourth and fifth Tests of England Vs India Test Series: Virat Kohli (Captain), Shikhar Dhawan, KL Rahul, Prithvi Shaw, Cheteshwar Pujara, Ajinkya Rahane (vice-captain), Karun Nair, Dinesh Karthik (wicket-keeper), Rishabh Pant (wicket-keeper), R Ashwin, Ravindra Jadeja, Hardik Pandya, Ishant Sharma, Mohd. Shami, Umesh Yadav, Jasprit Bumrah, Shardul Thakur, Hanuma Vihari.